This isn't your America. No matter who the president is. We're told that when we vote, when we elect representatives, we're gaining a voice in government and the policies it implements. But if that's true, why don't American politics actually translate our preferences into higher-living standards for the majority of us? The answer is that, in America, the wealthy few have built a system that works in their favor, while maintaining the illusion of democracy. The reality is that the quality of democracy in the United States is lower than in any other rich democracy, on a par with nations such as Brazil or Turkey. In the US, voters have little influence on eventual policy outcomes engineered by lawmakers. Political scientists call it the income bias and attribute it to the power of wealthy donors who favor wage suppression and cuts to important government programs such as public education and consumer protection. It causes American lawmakers to compete to satisfy preferences of donors from the top one percent instead of the middle class. It's also why our economy has been misfiring for most Americans for a generation, wages stagnating and opportunity dwindling. The election of Donald Trump shocked the world, but for many Americans, it came as a stark reflection of mounting frustrations with our current system and anger at the status quo. We need to find a way to fix the way our government serves us. The only realistic pathway to improve middle-class economics is for Congress and the Supreme Court to raise the quality of American democracy. 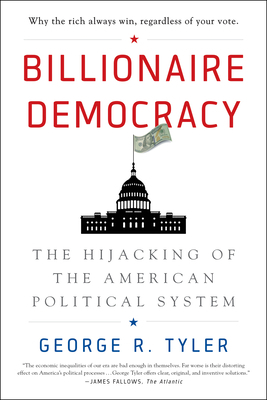 In Billionaire Democracy: The Hijacking of the American Political System, economist George R. Tyler lays out the fundamental problems plaguing our democracy. He explains how the American democratic system is rigged and how it has eroded the middle class, providing an unflinching and honest comparison of the US government to peer democracies abroad. He also breaks down where we fall short and how other rich democracies avoid the income bias created by the overwhelming role of money in US politics. Finally, Tyler outlines practical campaign finance reforms we can adopt when we finally focus on improving the political responsiveness of our government. It's time for the people of this nation to demand a government that properly serves us, the American people.